(Photo: © UNHCR / I. Prickett)Refugees and migrants arrive in Greece on flimsy boats after crossing treacherous seas to Greece mostly fleeing conflicts in Syria, Iraq and Afghanistan in September 2015. The Greek island of Lesbos is one of the first landing points in Europe for refugees and migrants fleeing conflicts. Many of them rely on smugglers to brave the treacherous Mediterranean in search of a better life. Members of non-governmental organizations and churches are the first people to welcome them onshore. One such organization is Agkalia (Embrace), founded by Father Efstratios Dimou, a Greek Orthodox priest. The Council of Europe awarded Agkalia the 2016 Raoul Wallenberg Prize for its work on Lesbos, but the priest died shortly before the award was given. Separately the Greek Orthodox Archdiocese of Athens is caring for the nutritional and clothing needs of refugees and migrants hosted at the identification and registration center on the Greek island of Samos. Known as a "hotspot", the center is under construction. The International Organization for Migration estimates that irregular migrant and refugee arrivals are now approaching 130,000 in the Mediterranean during 2016. The number, reached in nine weeks, falls just short of the total for all seaborne arrivals in Europe as recently as 2014. Still, the numbers still fall far short of 2015's total, when over one million seaborne arrivals were recorded. But with 10 months left, it now appears likely that last year's total will be surpassed, possibly before the end of the Northern summer, the IOM says. Raoul Wallenberg Prize started in 2014 at the behest of Sweden, the Council of Europe's and it is worth €10,000 ($10,925). It is awarded every two years for extraordinary humanitarian achievements by an individual, group or organization. Agkalia was founded in 2009 on Lesbos by Father Efstratios, known as Papa Stratis, who died on 4 September 2015. 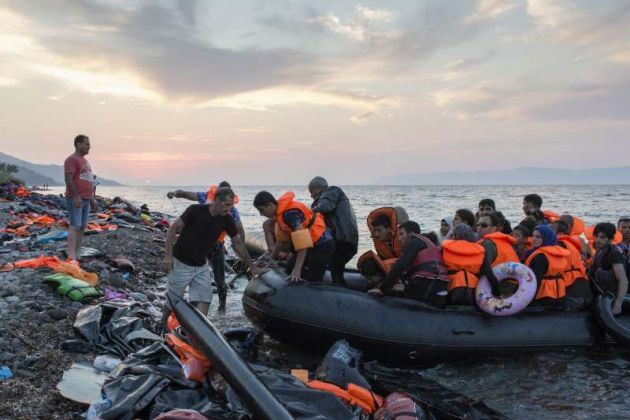 "Every day between one and two hundred people come to Kalloni," the 57-year old Orthodox priest said in an interview with the UN Refugee Agency (UNHCR) in July 2015. "The local people tell them to come to us for help. We give them food, water, milk for the babies, shoes, clothes. They can stay here too: we have blankets, mattresses on the floor." UNHCR noted Father Efstratios was suffering from a chronic respiratory condition and had to be permanently connected by a tube to a tank that supplies oxygen directly to his lungs. He died about a month later. The NGO has sustained support as its devoted associates pursue the endeavors of Father Efstratios. "Only humanism and tolerance can bring better days to Europe in this dark moment," said the representative of the Agkalia association Georgios Tyrikos-Ergas during the award ceremony. "The European people, volunteers from so many nations who responded to our call for help, set the example of how this can be achieved — through solidarity. Utopia or not, we have seen it happening in Greece with our own eyes". The Council for Europe citied Agkalia's "outstanding achievements in providing frontline assistance to thousands of refugees irrespective of their origin and religion". When the prize winner was announced in 2015 the jury noted that Lesbos has become a European gateway for refugees. It hailed Agkalia as exemplary in providing temporary shelter, food, water and medical aid to people in need, assisting some 17,000 refugees and migrants from May 2015. "As a small and flexible local organization based on volunteers, Agkalia sets a leading example of effective action by European civil society on a burning global issue," Council of Europe Secretary General Thorbjørn Jagland said, announcing the jury's decision. "Agkalia's activities reflect the fundamental values of the Council of Europe and contribute to its work to promote and protect human rights in Europe and beyond," he added. The award ceremony took place on Jan. 13 at the council's headquarters in Strasbourg. In financial crisis, Greece continues to play a pivotal role in accepting refugees and migrants and the Church of Greece is active on the islands in this process. Apostoli is the largest food relief organization in Greece, and works in partnership with International Orthodox Christian Charities. The Greek Orthodox Church hotspot provides food, clothes, medicines and bedding to all refugees and migrants arriving at the center. It includes thousands of beds which will be distributed to the other five hotspots now being built on several Aegean islands. Officials have noted the risk of refugees getting stuck in Greece if some neighboring countries decide to close the borders. "The government is making all the necessary moves so that this is averted," shipping minister Theodoros Dritsas said, adding that the creation of hotspots is a "national issue." Those working in assisting refugees and migrants say their task is often made more difficult over incoherence in European Union policy and the inability of EU member states to agree on its implementation.